Services : Bookings and reservations, Dine-ins, Takeaway, groups, parties. Located near the south toll of Sungai Petani, Overstepped Cafe & Restaurant is a industrial themed gourmet western restaurant, with elements of concrete, exposed bricks, bare metals, safety helmets and many “warning” signs. A view of the restaurant from Jalan Indah 2. Overstepped Cafe is just above Restoran Heng Kee. Overstepped Cafe & Restaurant was established since 2015, serving the local and tourists alike. The restaurant is at the first floor (above ground floor) of a row of shop houses beside the busy street of Jalan Indah 2. Located at a prime location close to the South Toll plaza of Sungai Petani (Sungai Petani South Exit from Lebuhraya Utara-Selatan), many can visit this restaurant from a speedy access of the major highways connecting north and south. There is nearby hotels includes Emerald Putri Hotel, the Pure Hotel, Park Avenue Hotel and Southern Lodge. Tourists can have walking distance access to this restaurant. Having extended opening hours from 12pm to 12am, Tuesday to Sunday, this is a perfect spot to hangout and dine with friends and family. It is a good news for those who likes late dinners and supper. The stairways leading you to the dining area at first floor. At the entrance, there is a stairs leading you to the first floor of this restaurant. The first impression is dark and groomy with a warm light at the end of the stairs. Well, stairs, it is not too environment friendly to those with special needs. At the end of the stairways, you will see the comfortable dinning area with industrious designs. The friendly waiter will greet you welcome and lead you to a seat. You will notice the extensive network of PVC pipes on the walls and ceilings. Don’t worry about the possible contents in the pipelines as it is mainly for decoration purpose. You will also noticed various safety equipment such as welders helmet and construction workers safety helmet are decorating the concrete walls. Creative masterpiece of making Wheelbarrow appears embedded into the walls, makes people wonder how it get there. One of the view in the restaurant. A closed up view of one of the dinning corner, showing various elements of Industrious designs. The lighting might be dimmed, but adequate for reading menus, dinning and taking selfies. There is several classic decorative filament lamps to add on to comfortable dinning environment. The dining area is spacious and not crowded. Occasional dividers are available if you wish for some privacy to family gatherings. Occasionally watch out your surroundings as you won’t want to hit over the dividers and partitions with many decorative ornaments or trip over metal table legs. The “smoking area” walls showing a beautiful graffiti and partially embedded wheelbarrow. The major part of the restaurant is air conditioned, however there is a small part of the restaurant is partly opened to the outdoor environment, dubbed the “smoking area”. This allows guest who wants to smoke and dine to have a comfortable spot to their likeliness. The decorations is similar to the indoors, but with a nice graffiti on the outside wall, expressing ones freedom. 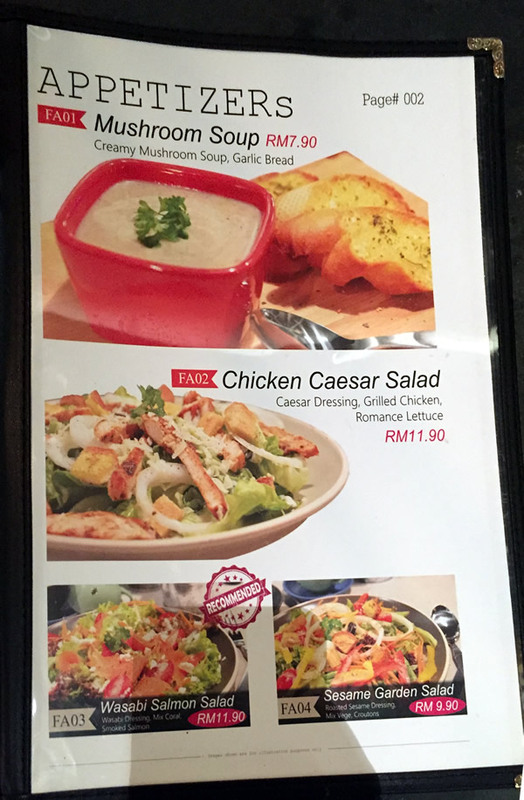 The restaurant serves varieties of western foods and drinks, including brunch, burgers, pasta, grills, snacks, desserts, smoothies, juices and ice blended. For those who wish to have something oriental and local to their tastebuds, there are nasi lemak, nasi ayam to choose from. The main meat served here is chicken, lamb, salmon and seafood (crabs and prawns). Overstepped Cafe – Pinky Salmon Linguine (Grilled Salmon with Sweet Spicy Creamy Sauce). Overstepped Cafe – Oriental Chicken Chop (Baked Bean Sauce, Frites, Coleslaw) . Overstepped Cafe – Chicken Cheese Carbonara (Cheese Patty, Linguine, Chicken Cubes). Overstepped Cafe – Teriyaki Grilled Chicken (Teriyaki Sauce, Bonito, Mix Salad, Wedges). Food is mostly tasty and not over seasoned, serving speed is acceptable depends on number of customers, the waiter is helpful. Prices can be above average but the environment worth the spend. You can get discounts depends on the offers available. The latest offer is “kids eat for free”, and “30% discount on bolognese spagheti or chicken carbonara if you have Tangela captured in your Pokemon Go game”. Well, terms and conditions applied, and subject to change. Do make a call to them, or visit their Facebook page or drop by to ask for more details. This restaurant is also open for reservations for special occasions such as party and birthdays. Make your birthday special in this industrious themed restaurant. Below is some of the example menus for your references.